Forty-year-old Willow Armstrong, creator and head of Pound Busters, a weight-loss empire, once thought she was in control of her life, but the past two years have proved her wrong. First, her husband, lieutenant governor of New York, announced during a press conference that he was leaving her for his campaign manager. That blow to her self-esteem and the resulting emotional turmoil led her to revert to eating patterns she left behind twenty years ago, and her thirty-pound weight gain has made her board of directors unhappy. Her move from size six to size twelve is just part of their dissatisfaction. A few days ago, life hit a new low when Willow’s trusted business advisor embezzled both company funds and Willow’s personal fortune and fled the country, a particularly bitter betrayal since Willow had defended him six months earlier when the board wanted to fire him. However, the bite that brought the wrath of the board on Willow and jeopardized her job was a greedily consumed slice of Tony’s extra-cheese pizza captured on video for the world to see. It shattered the all-important image of svelte discipline that Pound Busters was selling. Broke and uncertain of her next move, Willow remembers $8,000 and property in Bitton, South Gloucestershire, near Bath, that she inherited from her mother. They may be her salvation. She decides to journey to England to prepare to sell the property. Owen Hughes knows what it is like to have your life turned upside down. It happened to him when his ex-wife’s suicide made him the sole parent of a grieving six-year-old daughter. He left his work as a tour director in Europe, returned to his native country, and opened Wanderlust Excursion Cotswold Tours. He lives with his daughter Jilly and her dog, Henry, the last of the Petite Basset Griffon Vendéen hounds that her mother bred, in the same cottage where Jilly had lived with her mother. Owen has taken over as caretaker of the property after his ex-wife’s death in order to give Jilly much-needed stability. That stability is threatened when he learns that the American who inherited the property plans to sell it. Willow expects her visit to England to be brief, but she is unprepared for the ways the trip will change her life. The relationships she develops with Jilly, Owen, and Henry change her, as do the discoveries she makes about her family past, the grandparents she never knew, and the girl her mother was before she left England. Can Willow find a way to reconcile the more mellow, reflective woman she becomes in England with the driven, ambitious woman who devoted two decades to building Pound Busters? 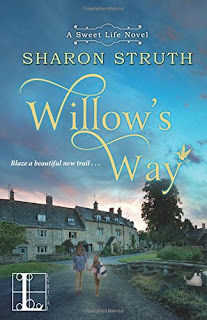 The second book in Struth’s The Sweet Life series is filled with finely drawn characters who will win readers’ hearts, internal conflicts that foster growth in Willow and, to a lesser degree, in Owen, and a setting so expertly rendered that the reader dreams of signing up for a Jane Austen tour. I especially liked that Willow’s new direction mirrors the changes that have taken place in her but does not eradicate all that she was. If you like women’s fiction with likable, sympathetic characters, a strong romantic element, and a strong sense of place, I highly recommend this book. Thank you for the review. This sounds like a wonderful read for those soft evenings before the heat and activity of summer set in. I like the plot of this book and will certainly put it on my Wish List. Thanks for sharing, PJ. I like that books take you away and make it so descriptive, you can picture it. This book sounds like one of them. Willow is facing a life that has been completely trashed. It is difficult to remember that there is still a life, just a different one than you expected to live. I like the sound of this book and the sound of Willow who learns to overcome. Thanks for this review. Sounds like a book I will love.